On March 14-15, tropical cyclone Idai hit Malawi, Mozambique and Zimbabwe. Currently, 600,000 people are in need of emergency humanitarian assistance. Your support is crucial. 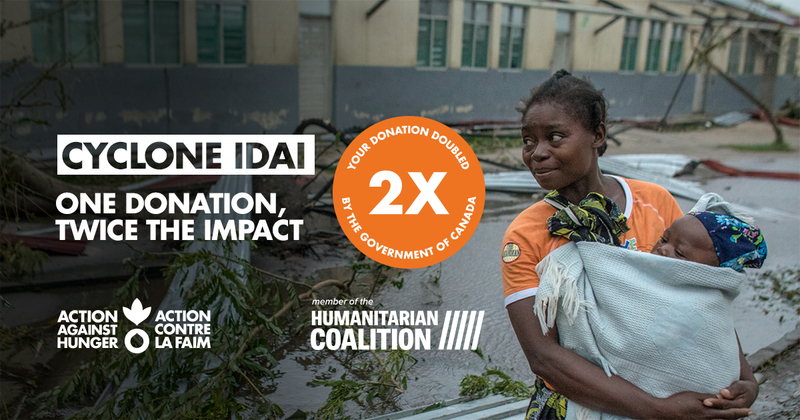 As the newest member of the Humanitarian Coalition, we’re raising funds for the Cyclone Idai joint appeal. By donating on this page, your donation will be matched by the Government of Canada. In Mozambique, our teams are working with our local partner, Kulima, in the Sofala region — the most affected by the cyclone. In Zimbabwe, our team is collaborating with Nutrition Action Zimbabwe to provide shelter, hygiene kits and kitchen kits. Water systems have been damaged and there is a huge risk of cholera and other diseases from contaminated water. There is a huge need for hygiene kit and shelter donations. Act quickly for maximum impact. If form doesn’t load above this message, please use this donation form.